*This is a sponsored post, however, images and story-line are my own, as we dined as guests of the restaurant. Every time we travel somewhere new to us, I seek out fun new places to dine. I make certain ahead of time via a phone call that my son with severe food allergies can eat there and of course the planning begins when I get the ‘Yes He Can’ answer. Have you been to the Brewery District in Columbus, Ohio? If not it is time to seek it out. 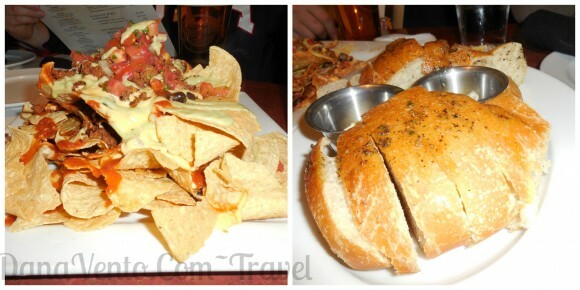 We traveled to Columbus, Ohio for an ice hockey tournament and we stayed downtown, close to the German Village (we ate at the Original Max & Erma’s there) and we were very close by to the Brewery District. Of course this meant my interest was peeked due to the unique name of the district and all I have read online about the area, and the brews. We arrived to our dining destination in the Brewery District In Columbus, Ohio and it was time to lavishly live food and allergen free dining out loud. The particular area, the Brewery District has been up and down in prosperity since it began. As it started out with breweries, and then changed, soon the area became known for its grand architecture ( it was night so photos would not do it justice, sorry) and of course some great bars to hang out at. Time progressed and the area once again plummeted from stardom, until the area recognized it was known for its Architecture as well as places to dine, rather than Bar Hop! Let me tell you, the dining establishments in this area are packed, have great followings and offer up good food. 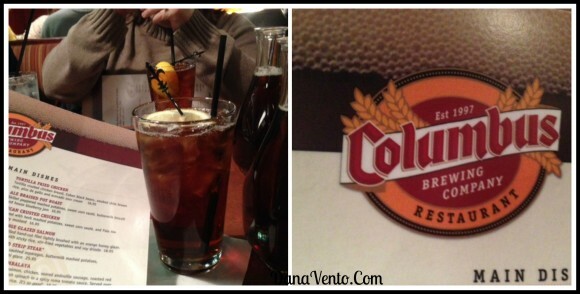 Our destination tonight was one such restaurant: The Columbus Brewing Company. We were with a group of friends and all of us had one thing in common, a need to feed! We ordered an appetizer of Nachos, followed by a table of Wood-fired pizzas, and Orange Glazed Salmon (not for my son). Our group included children and adults, and the menu offered something for everyone. In fact, The Columbus Brewing Company has a Gluten Free Menu, and offers allergen free dining (once you declare your allergies of course). We communicated our son’s food and tactile allergies to our server and they handled the rest! While it was very busy in the restaurant, we were not pushed along to move our meal so others can get in, and the staff checks back multiple times to make sure you are well-served-thank you! If you are dining here, go in a group, as this is not going to be the one-on-on experience that a romantic date might offer. Think of the movies where you see bars and restaurants filled with people, and its a good noisy, because everyone is enjoying themselves. The food is good, the atmosphere is light and it becomes good times, good food in a fun place, because the fun is just contagious. There are plenty of tables for groups and there are booths which fit parties of up to 6! Check out the iced tea, as it is served in these little bottles and the staff will water it down as it is replenished in your glass from this bottle. It has a nice flavor to it and if you are the DD then it is a great choice! So what is Orange Glazed Salmon? 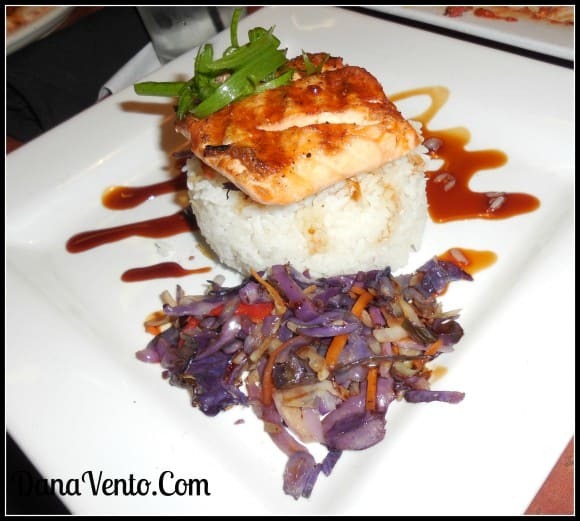 This is a really nice looking plate that offers sticky rice and salmon together on a platter, in fact 6 oz of grilled, hand-cut salmon which is glazed lightly with an orange honey glaze and a soy drizzle. It was exceptional and 2 of our party had this meal, both agreeing that it was just fabu and delish. This could total have been death on a platter for my son between the honey and the fish, sorry, sometimes I just have to laugh about it, and keep things light:) I am so protective of him but others at our table were hungry and ordered and loved it. 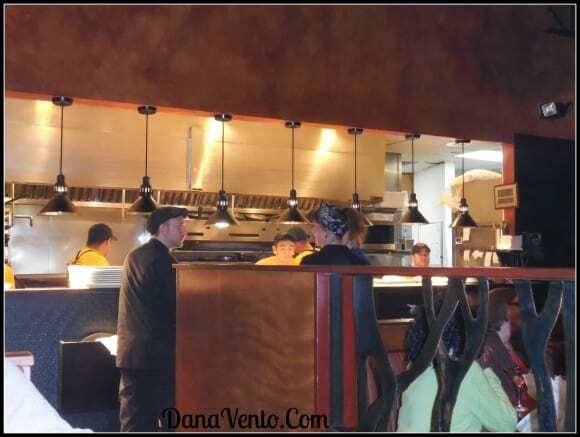 The Wood-Fired Pizzas are literally fired out from table to table, I have never seen so many pizzas going to tables. 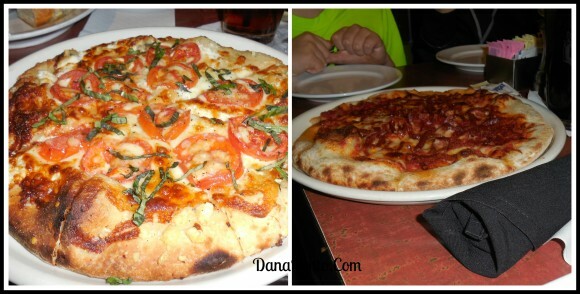 The pizza is a generous size pizza, and you can get it prepared in multiple variations. I chose the Margherita Pizza which offered herbed garlic oil, roma tomatoes, provolone, mozzarella, ricotta and fresh basil. There was plenty left to take home, but because I was personally hungry, I would not have suggested splitting it with someone. Additionally, I ate a house salad, which offered fresh leafy greens and a wonderful house dressing a small chunk of Corn Bread and Kalamata Olives. 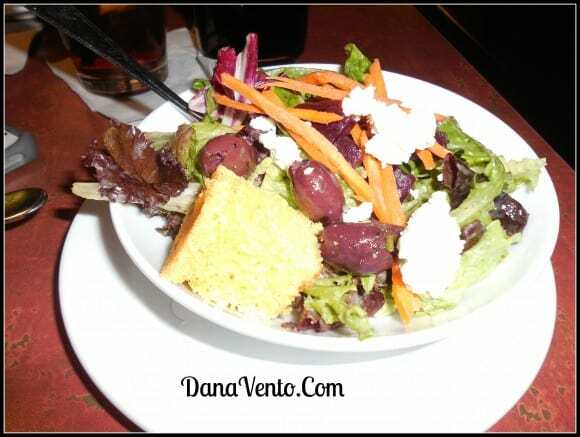 I did not care for the Goat cheese on the salad, I mistook it for Feta, but that is really not a big deal! There were also minced-up beets on the salad, which was quite the treat and unexpected. The Nachos were amazing. If you are looking for a great way to start your meal, something you can split among 3-4 adults while sipping on those great brews you have delivered to the table, you need to consider these nachos. They are not too heavy, not too light, offer meat(I had to scrape that off), beans, tomatoes, and pale ale cheddar, red chili sauce, pico de gallo and drizzled with avocado sour cream- Mmmmmmmm. The platter was table perfect and these reheat nice(yes we had some left! ) I loved the avocado sour cream, I could have dipped in that all night long! If you are out and about in Columbus, Ohio, and you are wanting a great tasting meal, have a group of friends you want to meet up with or just want some good brews, the Columbus Brewing Company would be your destination! Remember, they can handle food allergies including: nuts, latex and seafood as my son dined there safely so this is helpful to know! Lavishly live travel out loud, enjoy Columbus Ohio and this great find right in the Brewing District!